What is on my wheel? 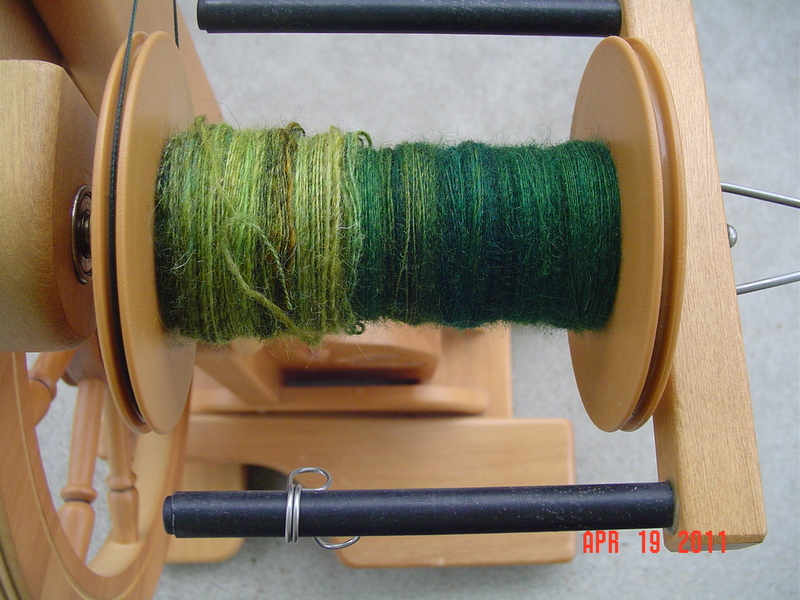 Spinning has taken a bit of a back seat since I got my hands on the fleece. Something had to give right? 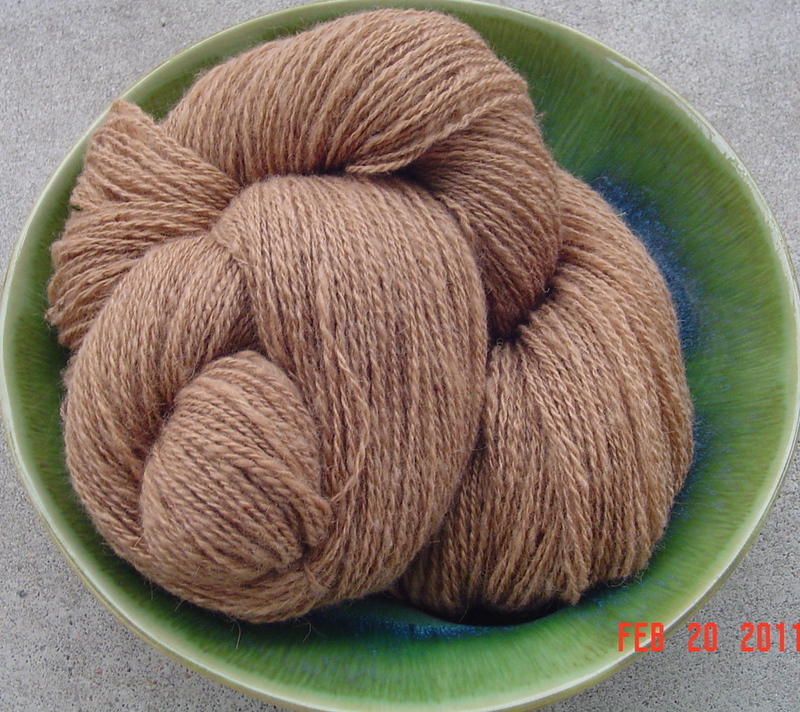 I started some BFL from C*Eye*ber fiber the weekend before last. 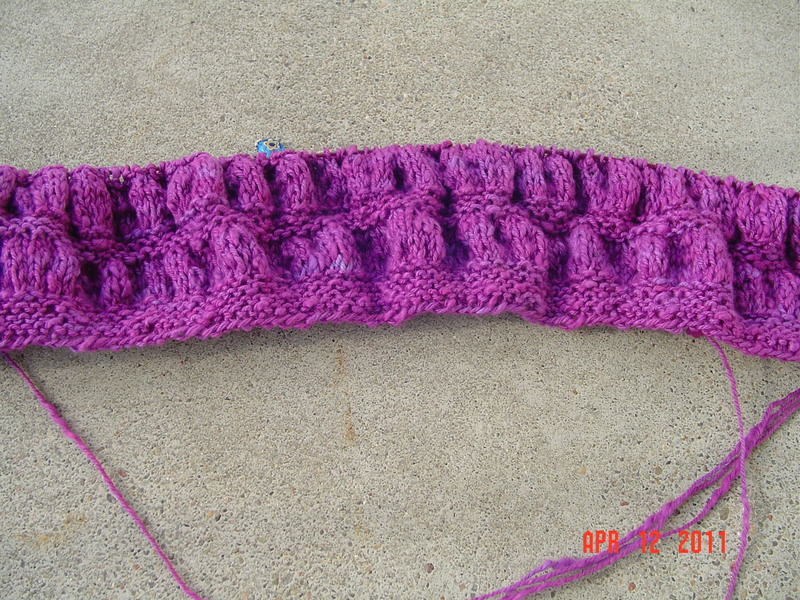 I had originally intended to do my typical 3 ply sock weight yarn, but once drafted, it asked to be a 2 ply laceweight. I love the richness in color on this one! I’ll get a chance to work on this tonight, and hopefully finish it up this weekend! 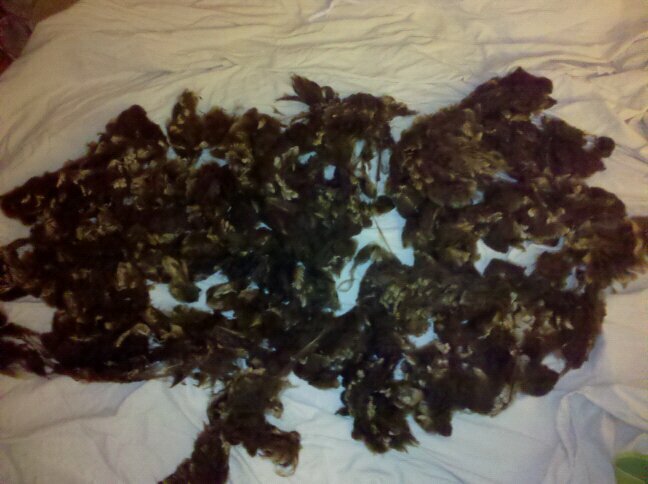 Since I now have a full bag of washed fleece, 2 pounds and an ounce of it, it is time for step 2. The next step is pre carding. Or flick carding. I don’t have a flick brush and don’t care to go get a dog brush, so I read a bunch on pre carding so I could just use my hand cards for this step. 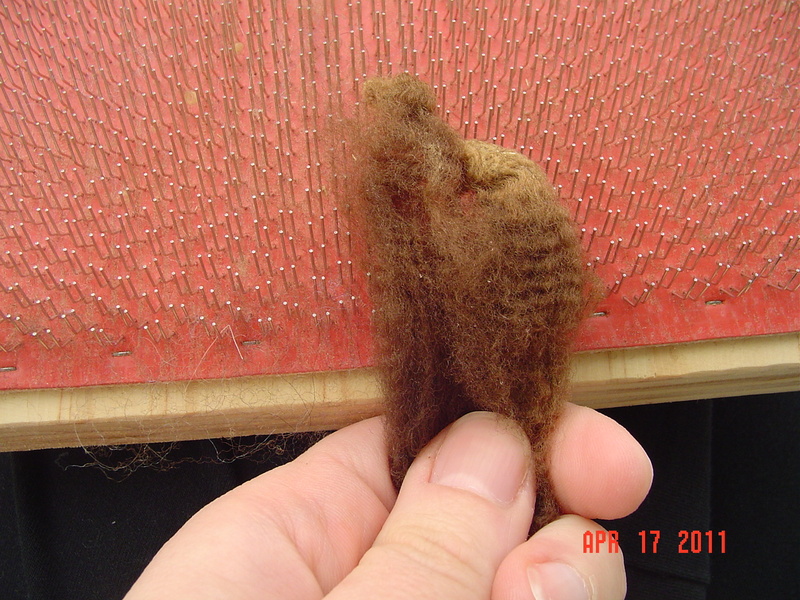 The purpose of this step is to get rid of any leftover vegetable matter, dirt, and second cuts before hand carding and making rolags for spinning. I spent all Saturday morning on this step, and it doesn’t look like I got very far at all. 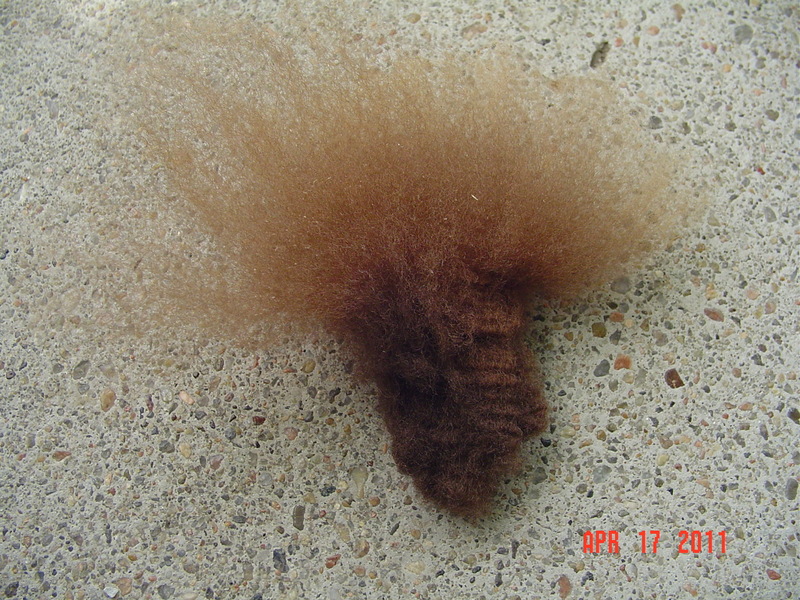 First, I find a lock of wool. The lighter part is the tip and the darker part is the base of the lock. I then hold the base firmly, and put the tip in one hand card, brushing the tip. The tips are a bit bleached, and have a little bit of yuck in them. Once I pull it through the comb, it opens right up, and the dirt falls out and is left in the comb. Then I have to turn around and do the base of the lock, so I gather those tips back, and put the base on the comb. 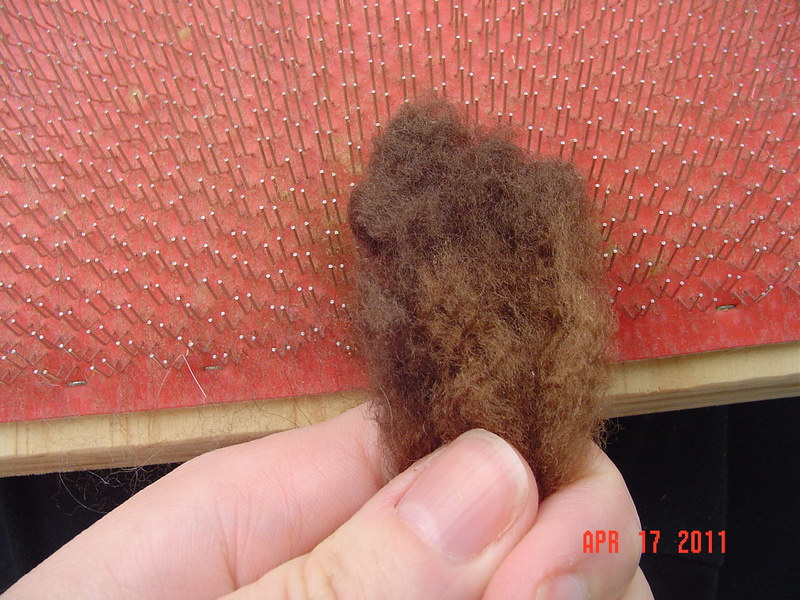 Once I pull it through, I’ve got a lovely bit of combed fiber, clean, with all the fibers aligned properly. I add this to a different bag. Remember when I said I worked all morning on this and it looks like I got nowhere? The second bag shows that I really did work at it. Bug was also very interested in being part of this process. While I am not ready to let her flick the locks, She was active in switching out my combs and removing the dirt, debris, and junk fiber from them. She was also very interested in keeping all the junk fiber to pad her dollhouses in wonderful softness. 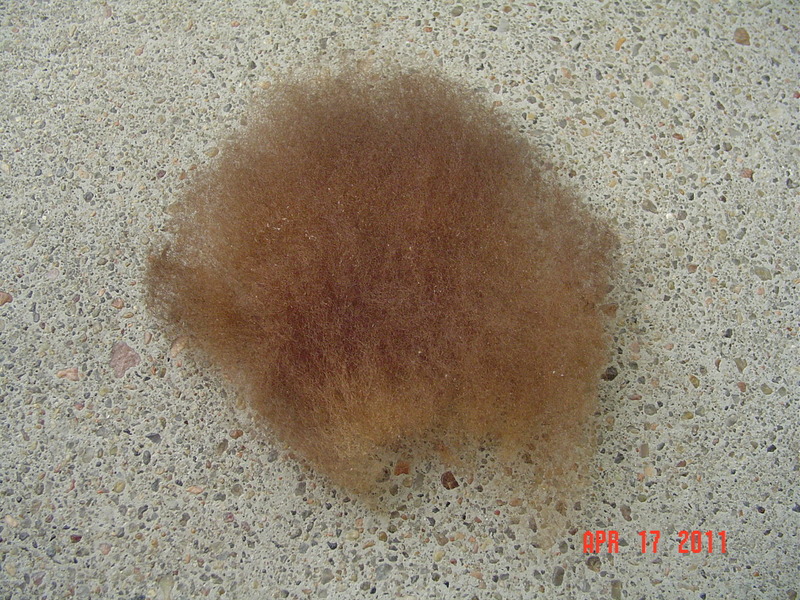 There is fiber literally everywhere right now! 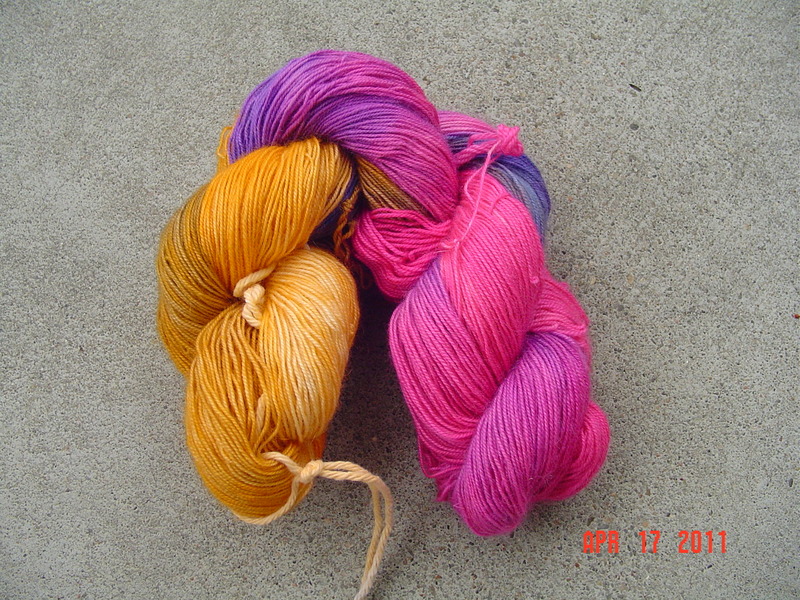 I stopped this process after dye day was over, as my shoulder had gotten quite sore from the use of new muscles. I might try to dedicate a night a week to this process now, in order to know that it will eventually get finished. I’ll just have to find a way to contain the junk it produces rather than ruining my furniture! We had such a busy evening yesterday. There was the pancake man fundraiser at Bug’s school, and math night. And Bug needed to be bathed before I turned up the hot water heater. Yet I couldn’t resist starting to wash my new fleece. I did take pictures, though all of them on my phone, so the quality isn’t fantastic. My excuse for this is that the quality wouldn’t have been fantastic anyhow, since the weather is absolute crap and I can’t take pictures outside. During Bug’s bath, I turned the hot water heater to high. 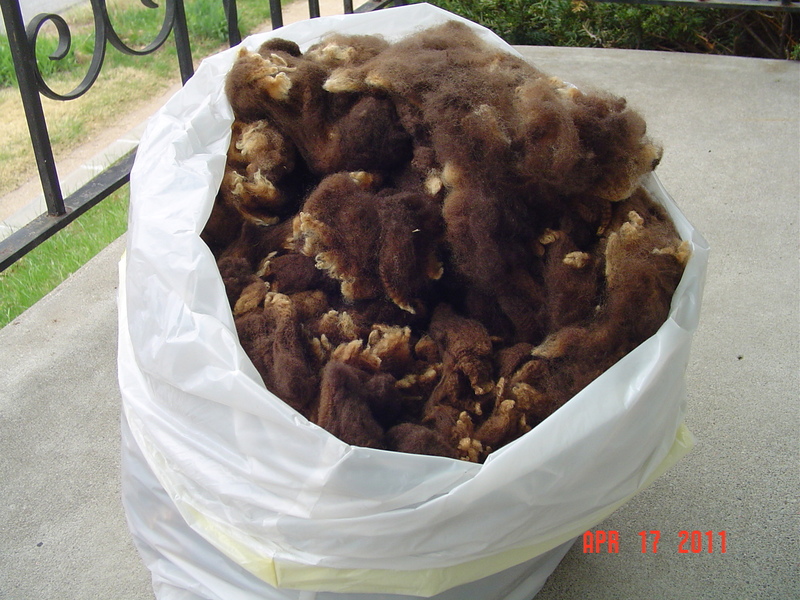 I put half the fleece into lingerie bags, and took them to the basement. 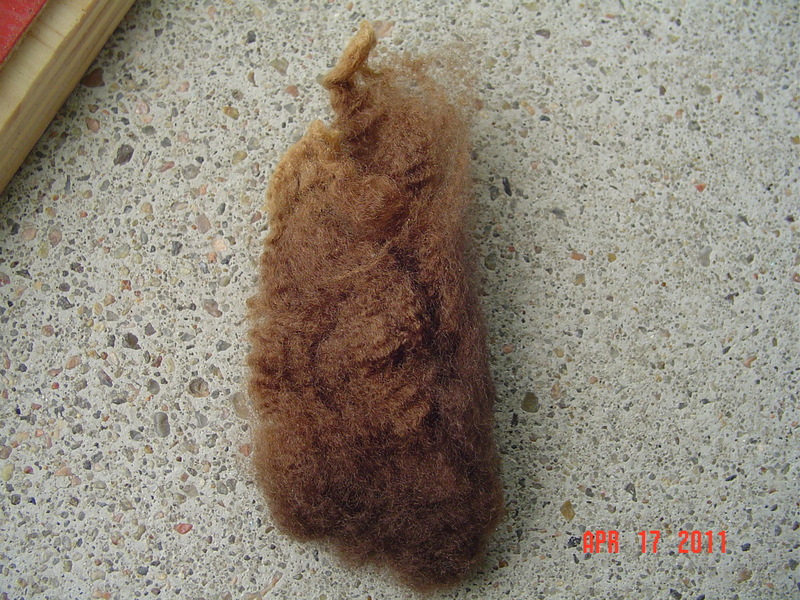 I had anticipated that I’d be washing this fleece in the washing machine. Turns out….my hot water cycle isn’t all that hot by the time the machine fills up. I ended up wasting a full drum of water and 1/3 cup of dawn dish detergent. So, I got Bug out of the bath and started on her bedtime routine, while filling the tub with truly hot water for the wool’s initial soak. 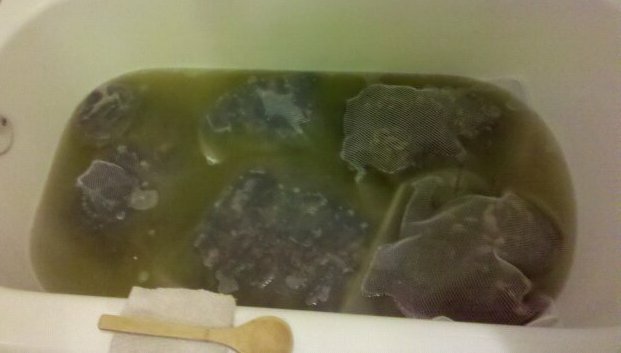 Once the tub was full and the water shut off, I added 1/3 cup concentrated dawn original scent dish detergent. You know the one, the one that cleans oil from animals at oil spills, and the one you use to make bubbles for kids. I stirred in the dawn with a wooden spoon, since the water was way too hot to touch. Apparently the idea is to avoid bubbles, and I managed that. Then I put the wool down on top of the water, no need to smoosh it in, it sank quickly. I set my timer for 15 minutes and walked away. Pretty gross huh? It actually is less gross than I expected. 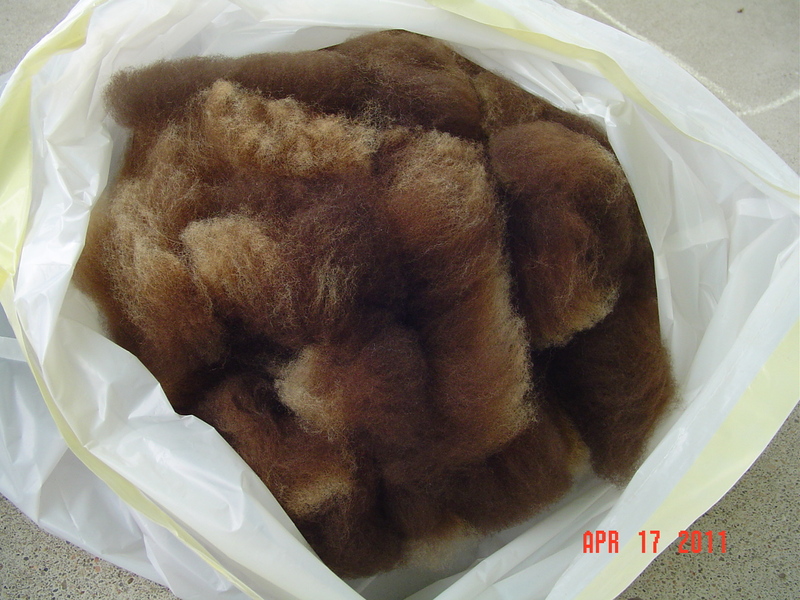 The fleece was amazingly clean to start with. I had been worried about the smell of the processes. Having a lamb fleece made it far less smelly I believe. Once the wool hit the water, it did begin to smell barnyardy, but not in an overly pungent and bad way. This was really amazing to me, the water was so full of lanolin that any contact I had with the water, which was minimal, made my hands instantly soft. It seemed that the dirt and dust really settled on the bottom of the tub. That is an amazing improvement on just the very first wash. We repeated the process for a third time in order to get really clean water. 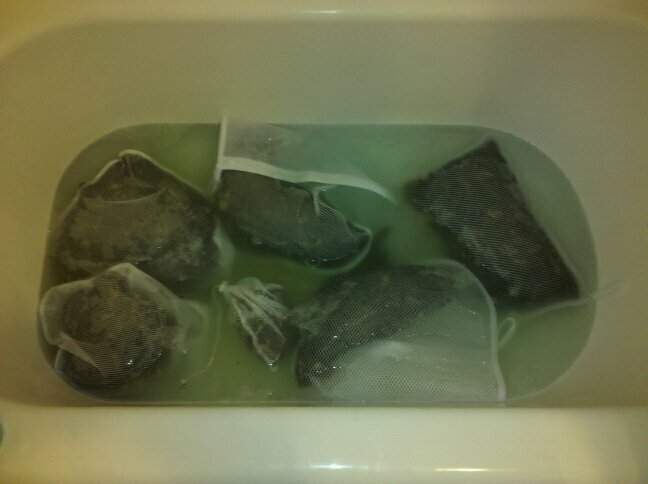 Then I repeated the process once more to rinse the wool. No soap was added to that bath, instead we added vinegar. I did not get pictures of this. Then I ran into a little problem. The problem was me not thinking, rather than an actual problem. 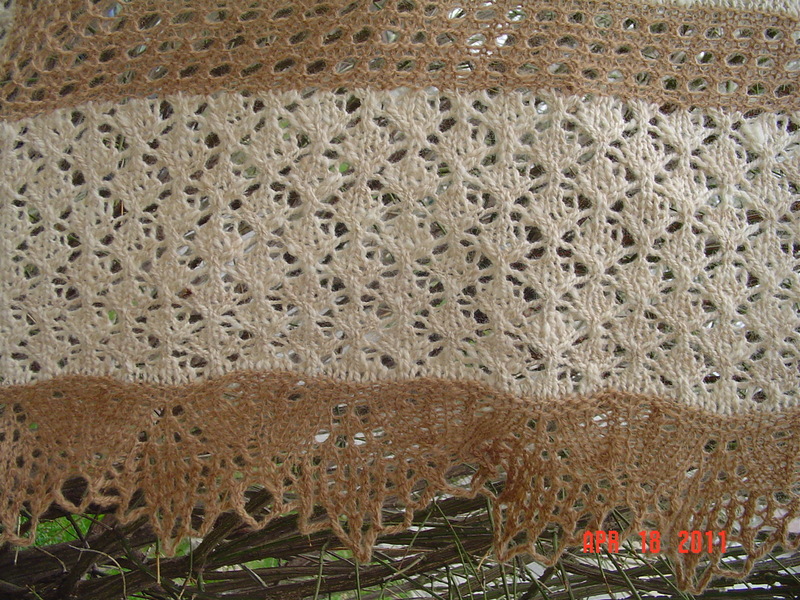 My original plan had been to make a “Hammock” out of a sheet on the porch, and allow the wool to dry out there. That got canceled on account of rain. I then planned to hang the wool in its bags in the bathroom until it drained well. The problem with this was that I had not anticipated on the wool holding quite that much water, and instead of draining into the tub, most of it was draining onto the bathroom floor. 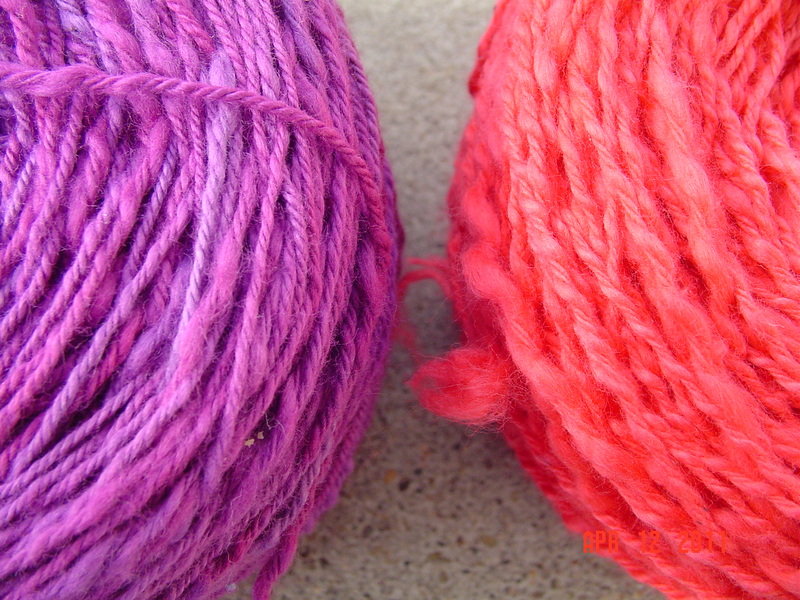 The bags were too hot to squeeze out, and I was afraid of felting them anyhow. Then I remembered that I could use the spin cycle on the washer. 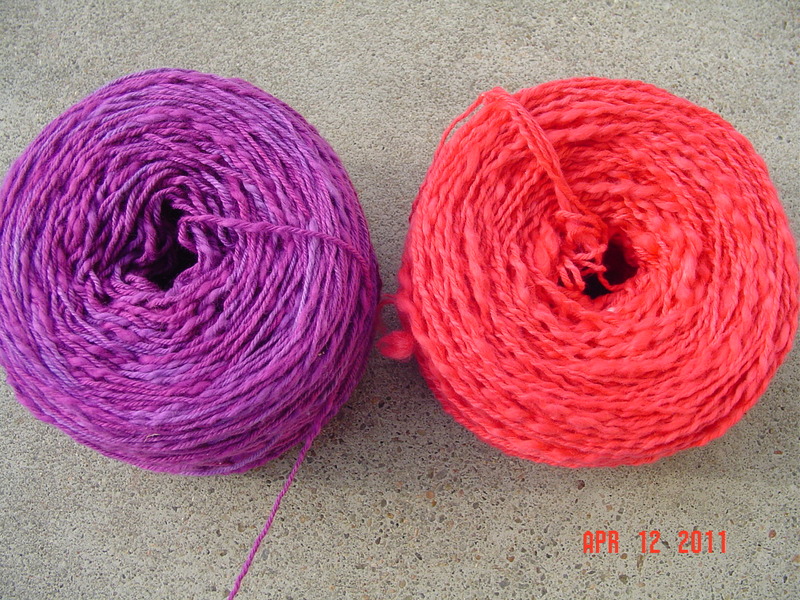 I lugged the bags of wool in a bucket into the basement, threw them into the washer, and spun them out. Worked like a charm! I then brought them back up, put a flannel sheet on the living room floor, and spread out the wool to dry. I had been so concerned about felting during this process. 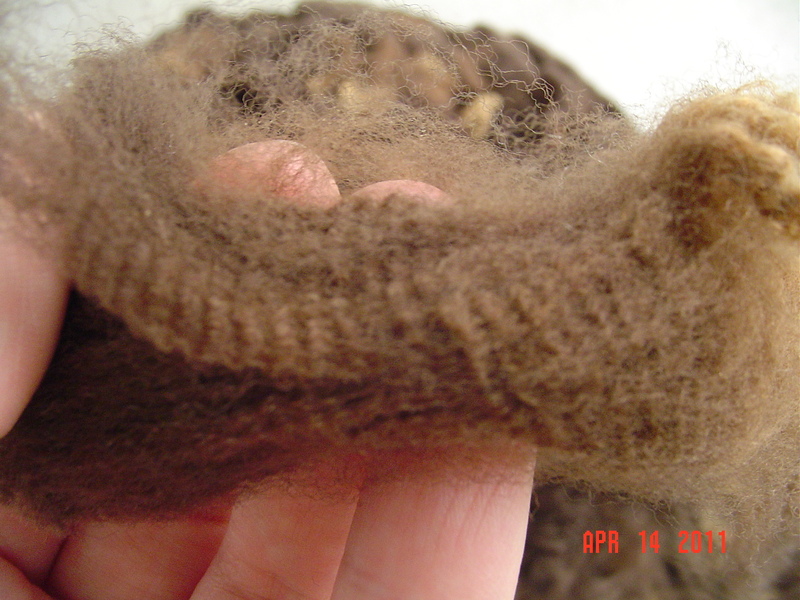 I about panicked over the wool when it came out of the bags, as it was all smooshed together and had such a different quality without the lanolin. 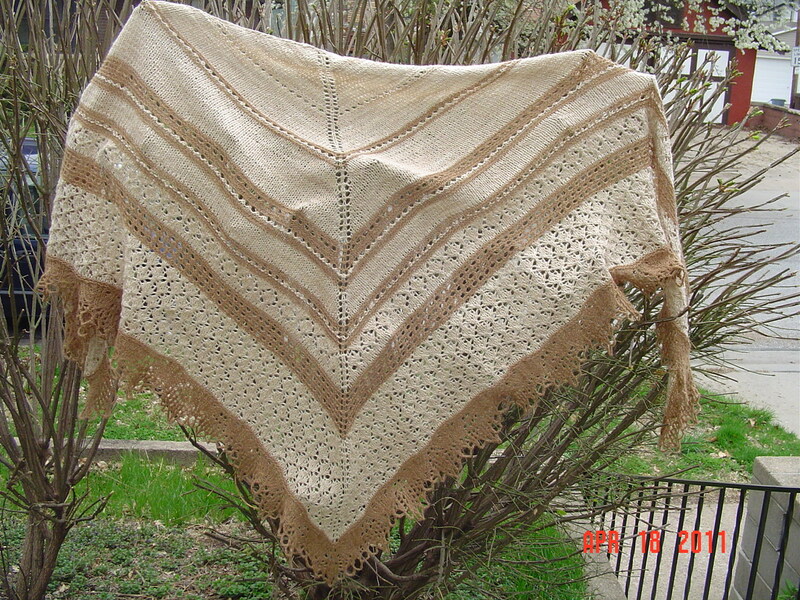 But….once I started moving it about, I realized that it had held up perfectly to my careful washes and soaks, and it felt just amazing. 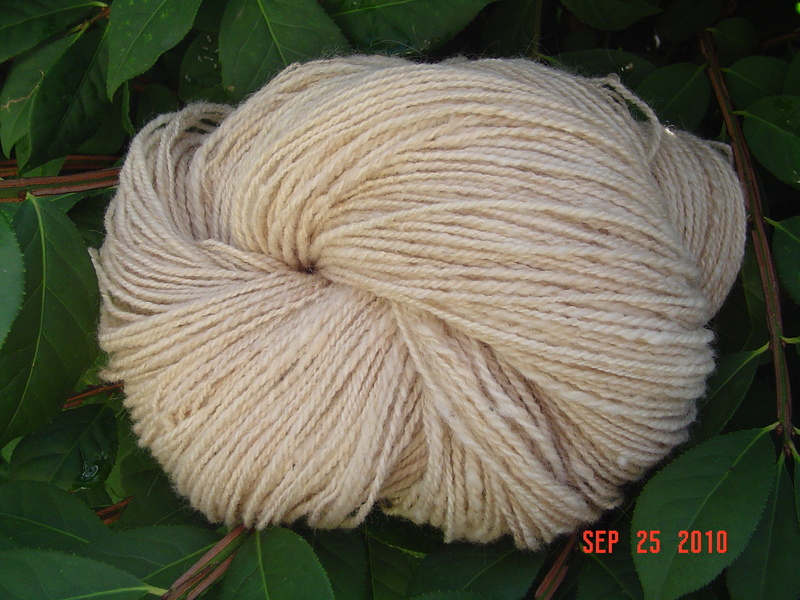 This morning I turned it, and hopefully I’ll have dry wool soon! Bug came downstairs this morning, got her hands right in it, and decided it felt like wool. As opposed to the stuff with lanolin, which she really didn’t like. 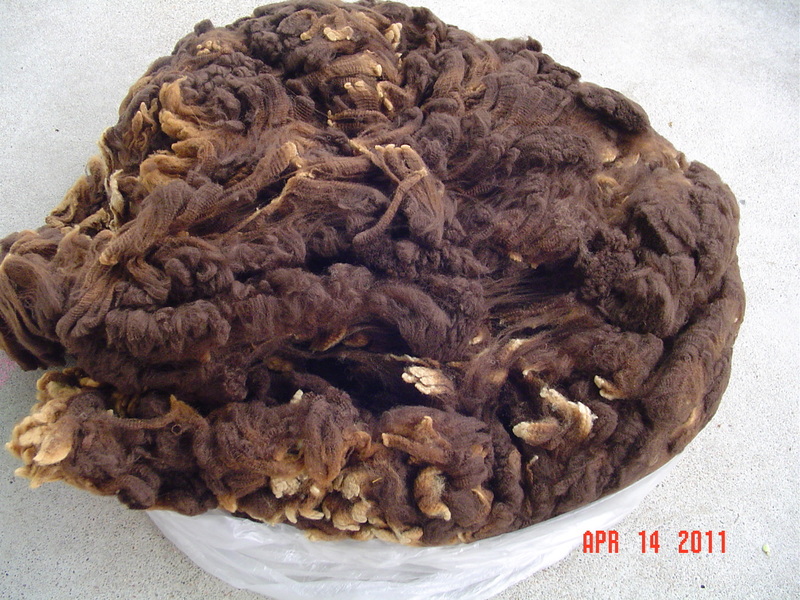 Tonight I have to wash the second half of the fleece. The hot water heater is still on high so now is a perfect time. 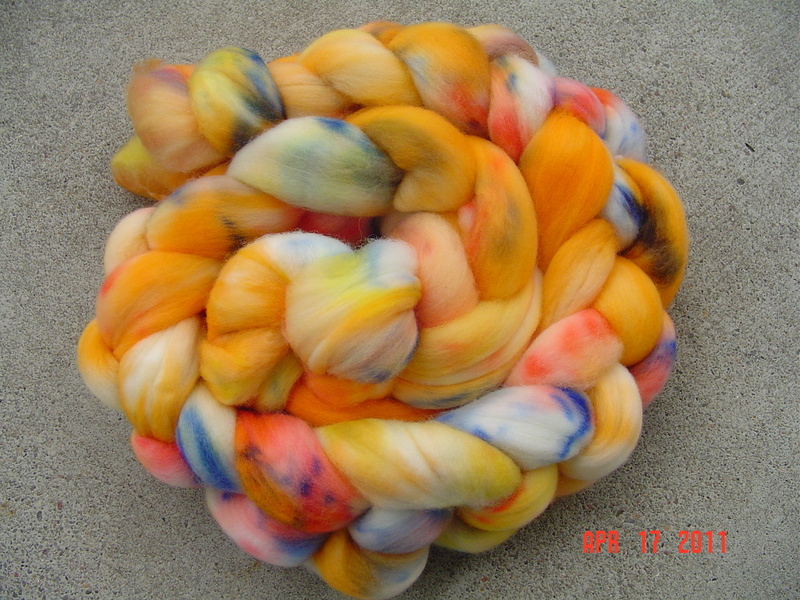 I think after the first and dirtiest soak, I will try spinning it out in the washer. 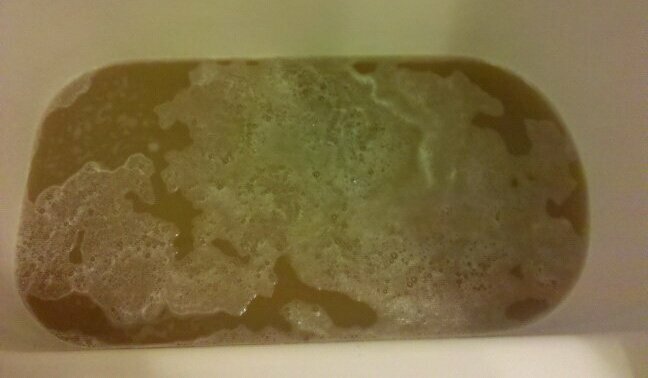 Hopefully this will help remove all the lanolin laced water from the wool, and I’ll only need one additional soak before I rinse. 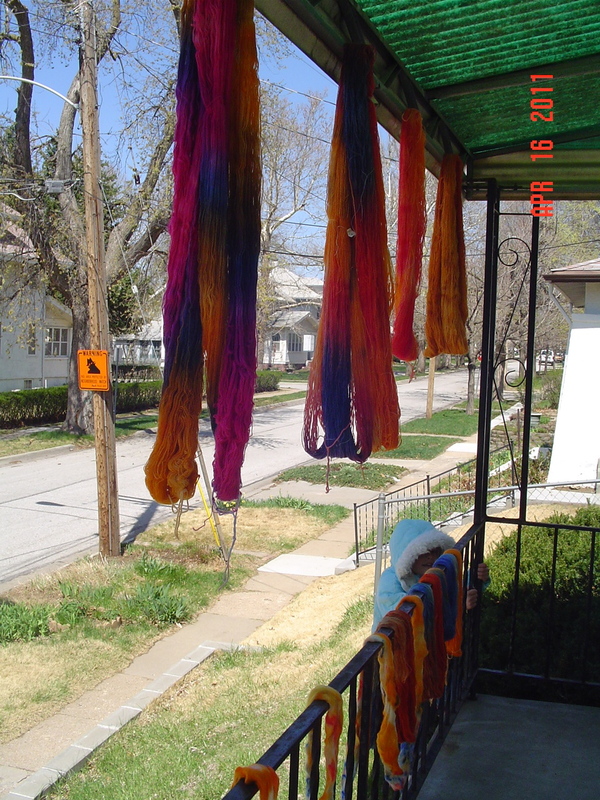 Tomorrow is a big dye day, and I should have lots of pictures from that as well. This is going to be a very fun and fiber filled weekend!